Anika Coltrane needs a miracle of her own. After burying her husband and newborn baby on the same day, she’s left with a six-year old daughter to raise. An answered prayer brings them together and Anika agrees to become a wet-nurse for the family. Delaney needs a safe place to grow up, away from sorrow and fear. Will they find shelter with the Ward family? Two broken-hearted families must find a way to move past the pain and choose forgiveness. Will they feed the shadows growing in their hearts or allow God to heal their wounds? Caroline Stephens was headstrong and determined. . .
At least those were the two words her father had used to describe her, but when it came to men she’d learned to hold back. ˃˃˃ Working as a maid had been the last thing she wanted to do for the rest of her life. . .
She’d always fancied getting married like her sister Edna had, but she hadn’t been as lucky in love. After their father had passed away the previous year things had been difficult but that was all changing now as she approached the town where she’d meet the man she’d agreed to marry. It would take them time to ease into life together, that was expected. But how long would that take? And what if he wasn’t the same man as she’d come to know in the letters he’d sent? 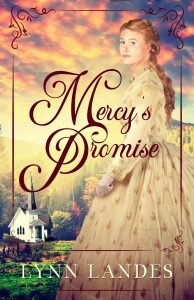 ˃˃˃ It had taken Leon Shaw a year of working all sorts of odd jobs to establish his ministry. . .
Now, though, he was reaping the rewards. The men seemed to understand the stories he shared about Christ and were giving their lives to the Lord. He’d considered all aspects of life on the prairie, and the one thing he lacked was a wife with which to share his life. Exchanging letters back and forth with Caroline had been a blessing. He’d started to feel connected to her in a way he hadn’t expected. Was it possible to fall in love with someone through their words? Because if it was possible, he would think he was in love with Miss Caroline Stephens. But will a case of mistaken identity cause Caroline to lose the trust in Leon, and threaten to destroy their young marriage? 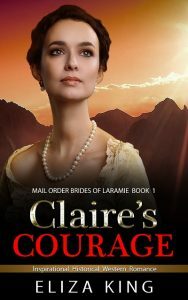 Will Leon be able to discover the source of Caroline’s doubt, and regain her trust as her husband, and as a man of God? Will a surprise from Leon’s past help him heal, and help Caroline understand her doubts? And will God bless Caroline and Leon in a way neither expected? 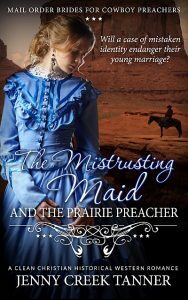 Find out the answers by getting your copy of “Mistrusting Maid and the Prairie Preacher,” the third book in Jenny Creek Tanner’s Mail Order Brides For Cowboy Preachers Series today!